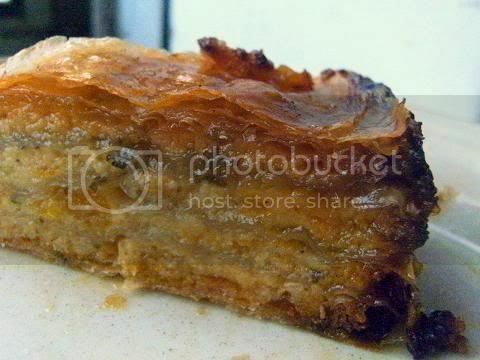 This month's challenge is baklava with home made phyllo pastry (yeah!!!). A wonderful challenge and so much fun. My neighbours who had over 120 years of experience give me an enormous amount of help thank you so much.The baklava's I made are about 1 inch (2.5 cm) high since several people have asked me how tall they are. A marvellous challenge thank you Erica for the recipes and the opportunity to make phyllo pastry. See here for a PDF for the challenge recipe. Wow what a fabulous challenge I have always wanted to make baklava because it is so delicious and more-ish. 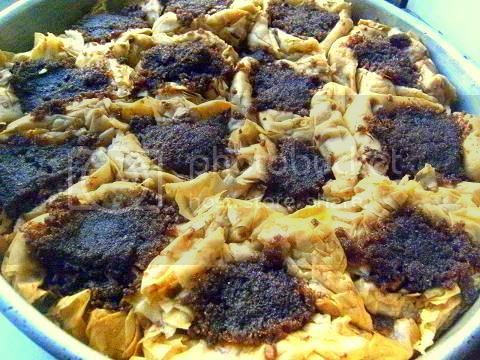 My neighbours love the start of the month since they know they will be having some of my challenge results and when I mentioned that it was baklava there was extra excitement since most of my neighbours are Greek and Turkish and they have a lot of experience with this dish. It was “decided” that I would attend a tutorial held by two of the ladies (one Greek lady 84 y.o. and one Turkish lady 80 y.o.) who have 120 years of experience in total with this recipe. This tutorial was to “pay-me-back” for all the dishes that I have provided them over the last couple of years. Well I had absolutely no choice about the situation and I didn't mind at all, and I have to admit it was wonderful fun to learn about this ancient dessert. The ladies and I had such a great time together they really enjoyed teaching me all the “tricks of the trade”. The two ladies came to my kitchen and we started they were amazed that the Daring Bakers' recipe was (almost) the same as their recipe which was a good sign. I made up the dough the ladies advised me to use “OO” flour (i.e. 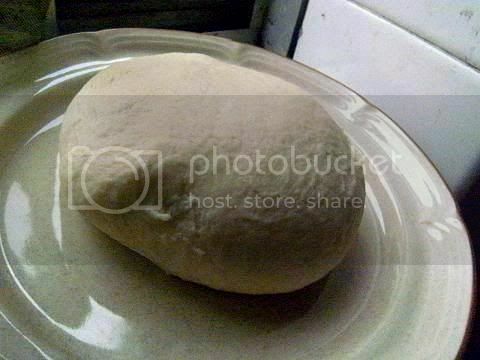 pizza flour – a finely milled flour) since the resulting dough will be easier to stretch than if I had used normal all-purpose (plain) flour the dough was rested for two hours. Coincidentally the phyllo recipe is exactly the same as the strudel challenge that the Daring Bakers' did a while ago. After two hours I stretched out the dough to paper-thinness as I had done for the strudel challenge. The ladies said it was best to flour a clean sheet and stretch the dough on the sheet, this is the procedure I used for the strudel challenge and it works really well, also having the pastry on the sheet helps when you need to move the pastry from the table to the baking dish. Then we made up the clarified butter and olive oil mixture for the phyllo pastry. 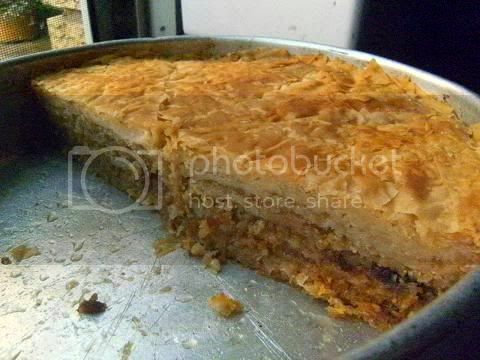 The ladies insisted that clarified butter was better to use than normal butter since removing the milk solids gives a very crisp crust to the baklava. Also butter and olive oil (mostly butter and a couple of tablespoons of oil) was better than all butter since the pastry can get to a higher temperature which is important when we add the syrup. 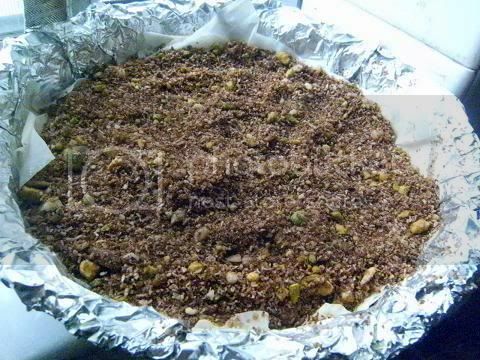 And now to the filling I used a mixture of desiccated coconut, pistachios, hazelnuts, pumpkin seeds, brown sugar, cherry extract and cocoa powder with a heaped tablespoon of ras el hanout I LOVED the taste of the filling it was superb so intriguing and taste bud stimulating. The ladies were a little amused with the filling flavour profile but they said they liked it especially the coconut/cocoa/cherry and the spicy over note. Coconut, pistachios, cherry and cocoa with a hint of spice really go well together I feel. 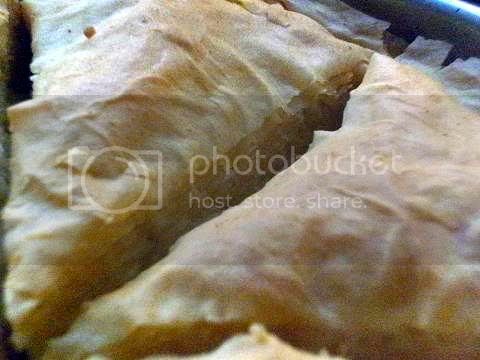 6 layers of phyllo. The ladies said it was best to use a very light hand and just sweep the butter/oil mixture over the phyllo pastry. 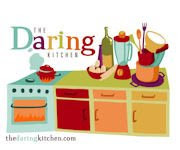 The ladies suggested a baking procedure that was a little different to the challenge method – bake for 30 minutes at 390°F (200°C/gas mark 6), then for 30 minutes at 300°F (150°C/gas mark 2), then for 30 minutes at 210°F (100°C/gas mark ¼). Finally, turn the heat back up to 390°F (200°C/gas mark 6) at the end to give the top a good dark golden colour. It really worked a wonder the baklava had an amazing colour and the phyllo was extra crispy. Then I made the syrup I'm not a big honey fan so I used golden syrup and brown sugar with lime juice (to make the syrup less sweet) and ras el hanout I ADORED this also it was so so tasty I could have this on toasted bread and be a very happy camper. Since I was using dessicated coconut I used almost twice as much syrup as stated since the coconut absorbs the extra liquid. 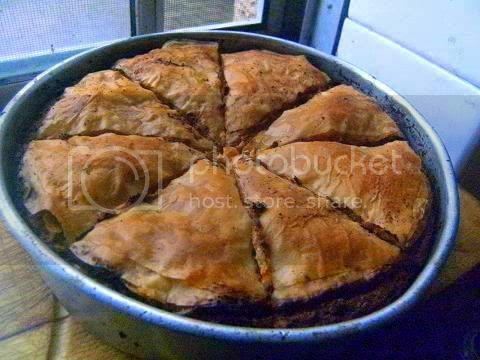 If you use golden syrup and brown sugar the syrup will be dark and if the baklava is stored the pastry will go dark. 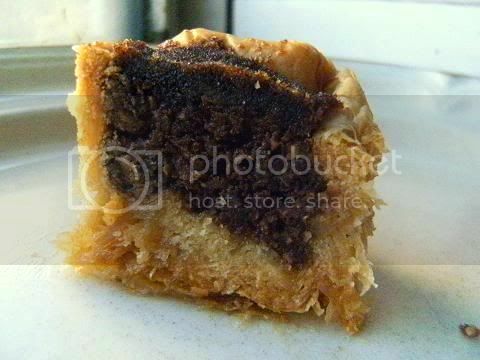 What was very interesting and not mentioned in the write-up of the recipe was the amazing sound that was produced when the cold syrup was poured onto the hot pastry it really sizzled and the pastry absorbed the syrup very quickly. WOW the baklava is so moist and juicy and not that sweet which is what I wanted, it is so intriguing that the main taste was pistachio with chocolate then coconut then cherry and then a spicy lime finish yum yum. 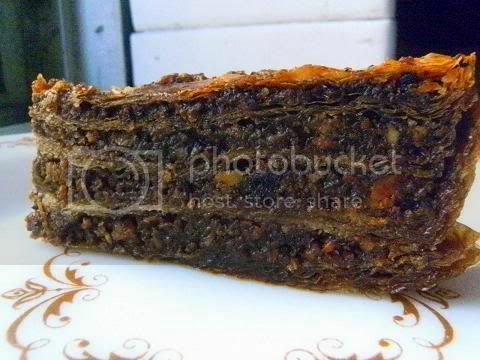 After an overnight rest I tried a thin slice of the baklava the flavours had melded together beautifully and the texture was stunning and the cut slice looked like a layered chocolate cake! I love how the coconut holds the syrup and the baklava wasn't too sweet at all, using brown sugar, golden syrup and lime juice really helped keep the sweetness in check. When the slice was bitten into it oozed a lovely thick juice that really made the baklava a joy to eat. I sometime find baklava too sweet, too dry and has a too strong honey over tone but this was so moist, juicy and had a lovely flavour profile that was so unlike normal baklava. If you want a light well-risen baklava with crisp separate phyllo layers, lightly butter each second or third sheet of phyllo and don't make too many cuts into the baklava and don't use too much syrup and serve after 3 or 4 hours. If you want a dense moist baklava that cuts cleanly, heavily butter each phyllo sheet make a lot of cuts into the baklava and use the maximum amount of syrup and store before serving. The ladies give me a 8/10 for the baklava I made and I was very very happy with that they said I lost points for the non-traditional filling (which they liked) and I didn't do the cuts that well since I used a serrated knife instead of a normal knife LOL LOL I thought this was a fair assessment <3<3<3 Their work is 10/10 so I was glad that I had done so well. They are such lovely and giving ladies. A big thank you to Eleni and Afet for your advice and for the wonderful knowledge that you shared so willingly with me. I had a great time. I'm sure that the other members of the forums will appreciate your tips and hints. 1. Use a finely milled flour like “OO” or pizza flour since this will make stretching the phyllo easier. 2. Rest the dough at room temperature for at least two hours longer is better. Oil spray and cover well with plastic wrap when storing. 3. Carefully measure the vinegar in the recipe since the acid in the vinegar softens the gluten in the flour and too much will make the dough too soft and difficult to handle. 4. When you are stretching the dough do it slowly with occasional rests if you are too quick you will tear the gluten strands thereby making holes in the phyllo. Don't worry about a few small holes that is normal. 5. Use clarified butter (ghee) this will enhance the crispiness of the final baklava. You can use a mixture of clarified butter and olive oil (mostly clarified butter with a couple of tablespoons of oil) if you wish, the ladies suggested that the butter/oil mixture helps heat up the baklava better than butter alone so the syrup really sizzles when it is poured on it. 7. 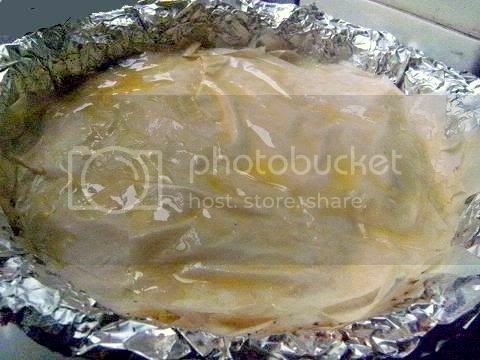 Cut the phyllo sheets to the shape of the container, butter and stack the phyllo sheets outside the container and then place the stack on the nut filling in the baking dish. 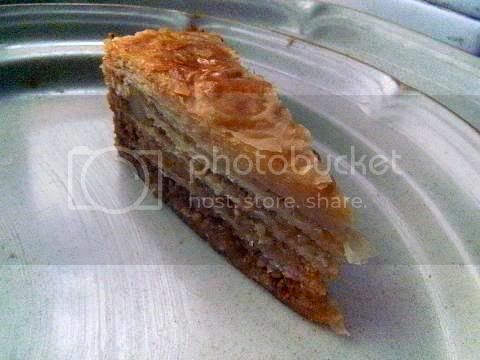 This is the easiest method to do the construction of the baklava this helps give even layers in the final dish. 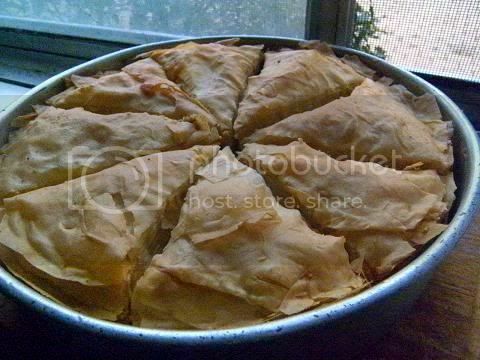 Make sure you firmly push down the phyllo sheet stack onto the filling so there are no air bubbles. 8. 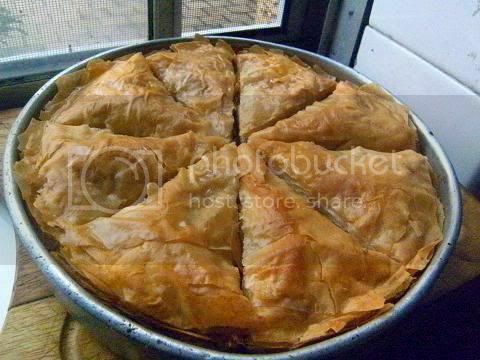 For special celebration baklava only slice half way down when making the cuts for the individual pieces then bake this ensures only the top parts will rise and the baklava base will have a slightly denser texture that will not fall apart when picked up with fingers. This gives a better look to the finished individual pieces when served. 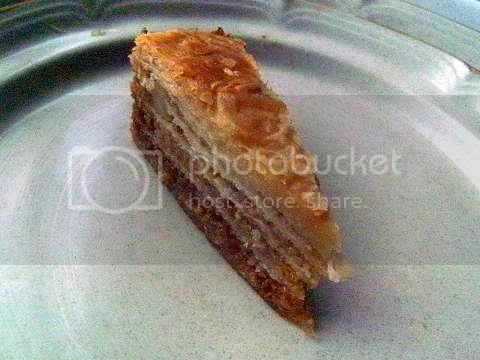 When the baklava is 3/4 baked you can cut all the way through. 9. Pour firstly (using a jug with a thin nozzle or similar) most of the syrup into the cuts then a little syrup on the tops of the individual pieces this technique ensures optimal flaky crisp pastry tops. 10.You can use other sweeteners apart from honey for example agave nectar, golden syrup, molasses (blackstrap or barbados), sucanat, brown rice syrup, fruit nectars, fruit juice, herbal teas, black tea, green tea and barley malt. Add spices and herbs into the cooling syrup (high temperature syrup can dull the flavours of spices and herbs). 11. Taste the syrup you can add lime/lemon juice to cut back the sweetness. It is important to add 1/2 teaspoon of vinegar or lime or lemon juice to the syrup this will stop the syrup crystallising in the baklava. 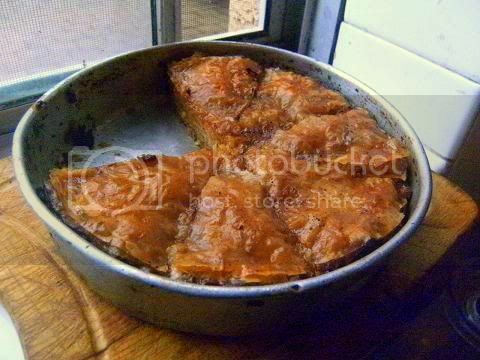 Do not refrigerate the syrup if it is too cold it will crystallise inside the baklava. The more syrup you use the easier the finished baklava is to handle and cut since the syrup helps bind the layers together keeping it moist and chewy. 12. It was suggested the best baking procedure was – bake for 30 minutes at 390°F (200°C/gas mark 6), then for 30 minutes at 300°F (150°C/gas mark 2), then for 30 minutes at 210°F (100°C/gas mark ¼). Finally, turn the heat back up to 390°F (200°C/gas mark 6) at the end to give the top a good dark golden colour. 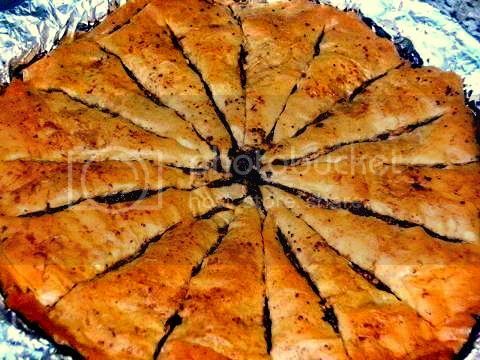 It is best to use straight-sided baking trays, if the tray is dark coloured line with foil which will stop over-browning of the baklava edges. Remember to rotate the tray throughout the baking time. 13. Make sure the baklava is hot straight from the oven when you add the cooled syrup wait for the sizzle this shows the syrup is being absorbed by the pastry. 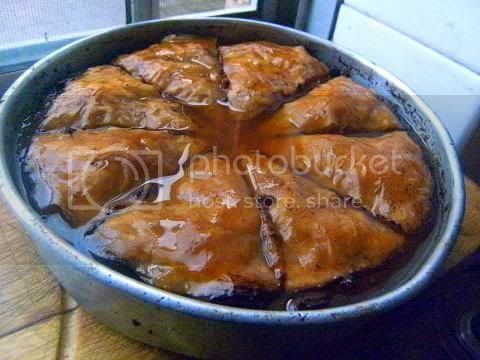 The hot baklava and the room temperature syrup ensures that the phyllo sheets will be crispy in the finished dish. It will look like too much syrup but it will be absorbed over time. Pour most of the syrup into the cuts then pour the rest evenly over the tops of the pieces. 14. Let the baklava cool to room temperature (this will take a few hours) before covering for storage. 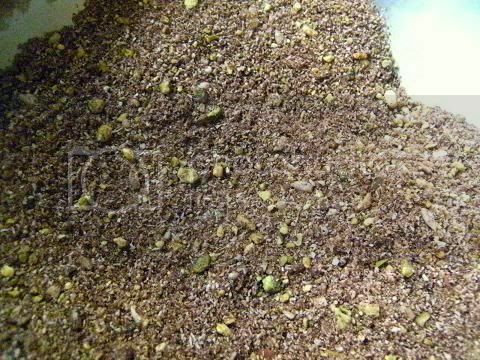 “Ras el Hanout” ("top of the shop" ) is a spice mixture from Morocco that can contain anywhere from 10-100 different spices. There is no definitive set combination of spices that makes up Ras el hanout. Each shop, company, person have their own secret combination containing over a dozen spices. Typically they would include cardamom, clove, cinnamon, ground chilli peppers, coriander, cumin, nutmeg, peppercorn, and turmeric. 3. whey (milk solids) on the bottom ( a smallish layer of white liquid). Skim off the foam that rises to the top, and gently pour the butter off of the milk solids, which have settled to the bottom. A stick (8 tablespoons) of butter will produce about 6 tablespoons of clarified butter. I had to do a baklava based on apricots and peaches with white chocolate which is a classic flavour combination. I added dill and cardamom to the filling to add some flavoursome zing also I used some apricot and peach fruit leather cut to size to layer the filling since I had it to hand. If you are doing a nut free baklava it is best just to do phyllo pastry for the base and the top which I did about 12 layers each. For the syrup I used a combination of Chardonnay infused with black tea and orange marmalade with dill seeds and cardamom. I love macadamia, pineapple and ginger cake so I thought would do a baklava based on this flavour profile. This baklava is filled with macadamia nuts which have a buttery flavour and a creamy texture this is paired with tangy home-made candied pineapple and some freshly grated ginger. The syrup is made from pineapple juice, freshly grated ginger and white sugar. I wanted to experiment with the buttering technique for the phyllo layers in this baklava since I wanted the baklava pieces to have even layers and to have a fine finish to the cut edges, I heavily buttered each phyllo sheet for the bottom layer and then for the middle layers I lightly buttered each sheet of phyllo and for the top layer I only lightly buttered every second sheet. 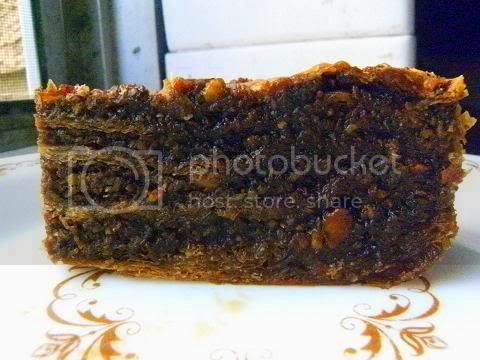 I thought this would produce a baklava piece that could be sliced thinly and cleanly and have a slightly denser base that wouldn't fall apart when picked up to be eaten. Also I used a board and a small tin can about 1/2 pound (250 grams) to weigh down the baklava while it was resting overnight this helped keep the layers nice and tight and helped make the slicing easier. 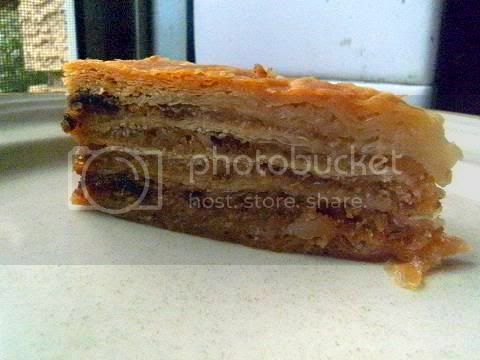 I only cut half way through the baklava at the start of the baking process and when 3/4 baked I cut all the way through. I made sure that I poured the syrup mostly into the cuts using a jug with a fine nozzle and used a little on top of the individual pieces. 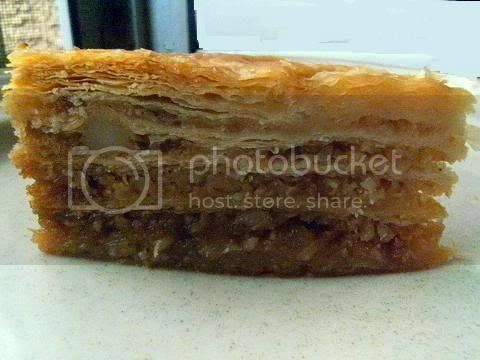 I really liked how this baklava looked when I sliced it after it had soaked overnight. 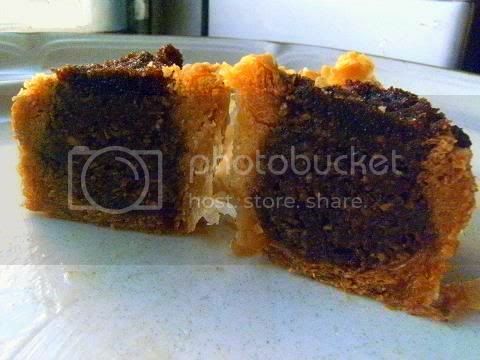 I could slice the big pieces that I had baked in the original baklava into very fine thin slices that had perfectly straight edges and a nice clean tip. 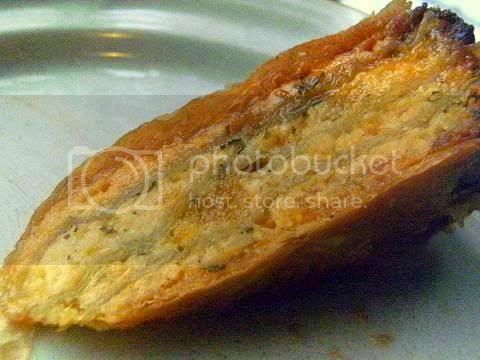 Also the texture of the phyllo layers gradually changed from the bottom (most dense and moist) to the top (crisp separate layers) of the slice. I was most pleased with the flavour profile since macadamina add a lovely base taste of butter while the pineapple and ginger add a nice zingy after-taste to the slice. Overall a good result. 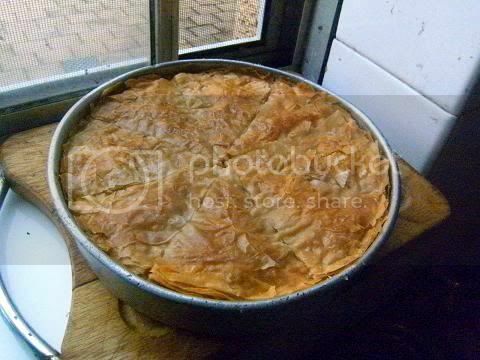 As can be seen you can manipulate the texture of the baklava phyllo layers by using different buttering techniques. 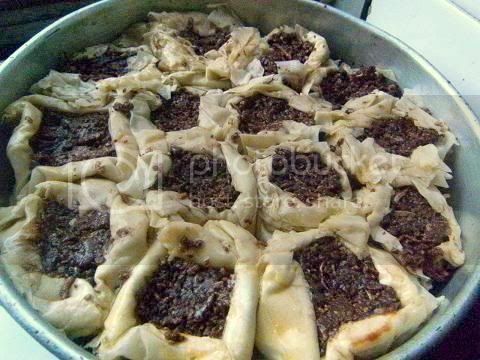 I wanted to make a baklava that consisted of individual pieces where the filling is exposed. 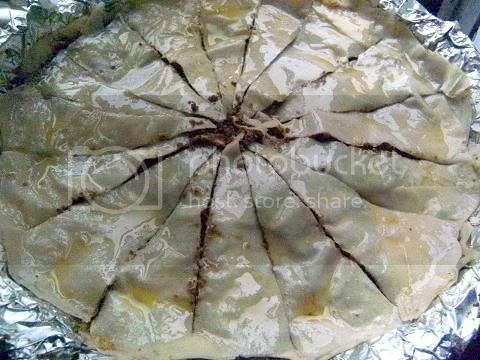 The pieces are easy to make, take 1½ tablespoons of Jaffa filling place onto a square of stacked phyllo sheet and fold the phyllo around the filling. The filling is cocoa powder/crystallised orange peel, I adore orange and chocolate (this combination is called Jaffa in Australia) I really like how this worked out, the individual pieces are delicious I like the ratio of crisp phyllo to filling, I used about a dozen layers for the stacked phyllo. 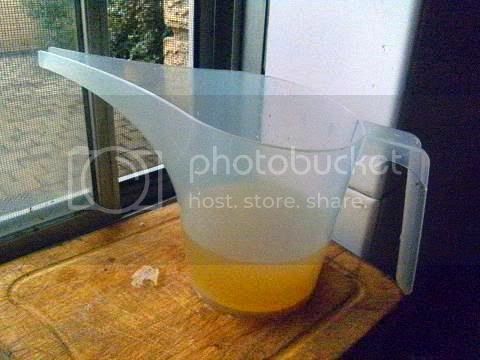 The syrup was golden syrup, brown sugar, orange juice and orange blossom water. This month's challenge was healthy potato salad also if we wanted we could enter our potato salad into a competition held by the U.S. Potato Board. 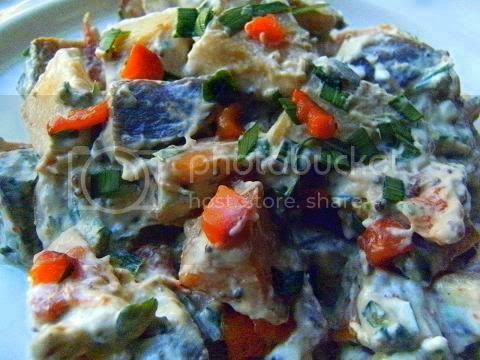 I will share with you one of my favourite potato salads – I have experimented, tweaked and thoroughly researched this recipe over nine years to obtain (I think) the ultimate light and healthy yet unctuously delicious potato salad. 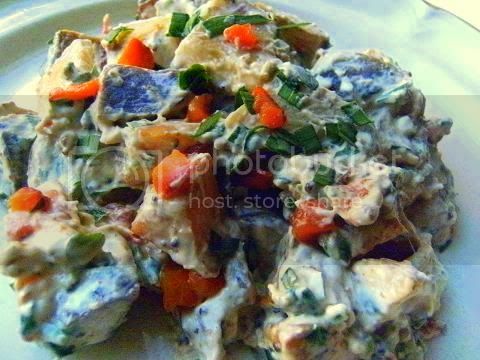 This toothsome potato salad is dressed with a lusciously tangy and deep flavoured Roquefort-like (blue) cheese dressing that is amazingly made from only non-fat yoghurt, light sour cream, crumbled cottage cheese, roasted garlic paste and a few herbs and spices – astonishingly these few ingredients when combined with bite-sized coloured potato pieces that have been oven roasted with a small amount of ghee (clarified butter) or olive oil, grainy mustard and sea salt crystals – produce a final dish that has all the mouth feel (tactile properties), taste (gustatorial sensations) and satiety (full belly feeling) of a high fat Roquefort (blue) cheese dressed potato salad! Roquefort cheese is known as the “King of cheese” it is a ewe's milk blue cheese with a magnificent tingly pungent taste. The cheese is white, tangy, crumbly and slightly moist, with distinctive veins of green mould. It has a characteristic odour and flavour with a notable taste of butyric acid. Roquefort has the highest level of glutamates (feel good chemicals) of any naturally produced food. The overall flavour sensation of Roquefort cheese begins slightly mild, then waxes sweet, then smoky, and fades to a salty finish. These tastes and textures are replicated in this recipe by using synergistic ingredients that work together (because they have the same flavour components and mouth feel as blue cheese) to create a near perfect faux Roquefort dressing, these ingredients are; roasted garlic (for its tingle and deep mellow flavour base which waxes sweet then smoky), grainy mustard (for its vinegar tang and its grainy texture), non-fat yoghurt (which has the same base flavour components as Roquefort cheese and is rich in butyric acid the major flavour sensation in blue cheese), light sour cream (for its tang and mouth feel), cottage cheese (for its crumbly texture and it is rich in butyric acid), ghee (rich in butyric acid and its buttery taste) or olive oil (has a many of the same taste sensations as blue cheese), sea salt crystals which add lovely salty flavour bursts like Roquefort cheese, chopped spinach and parsley (for their green colour and they are a rich source of glutamates), chopped mint which contains a number of the same flavour components as blue cheese, a small amount of optional Scotch Whiskey (which contains a lot of the same olfactory components as Roquefort) which greatly enhances the flavour profile of the blue cheese taste sensation, some optional chopped roasted walnuts (or walnut oil) which are a rich source of glutamates and the oils in these nuts contain a lot of the same taste sensations as Roquefort which greatly enhances the blue cheese flavour of the finished dish and finally some optional creamy cow's milk blue cheese to intensify the overall flavour profile of the final dish. 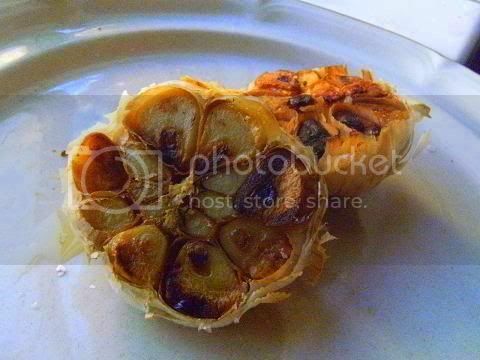 Don't worry roasted garlic has a very mellow 'earthy' flavour that is totally different from raw harsh garlic. 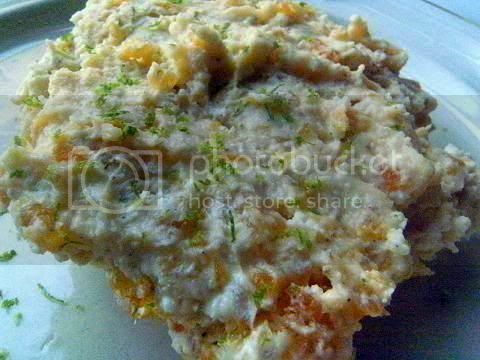 I have served this a large number of times at parties and BBQs while watching TV sports with spicy hot buffalo (chicken) wings (since the wings can be made in the same oven because they need to be baked at the same temperature and time as the potatoes and garlic) it always receives rave reviews so no need to have a high-fat blue cheese dip or an unhealthy potato salad. A colourful and scrumptious potato that is dressed in a light and healthy Roquefort-like dressing, this salad is low in fat and salt but high in essential nutrients that lifts the spirit and nourishes the body. 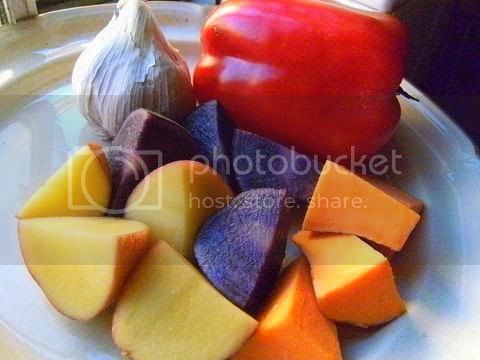 Chose a couple of these ingredients to garnish your finished potato salad. The marked (*) garnish ingredients have common flavour components with Roquefort cheese. I like black olives, cherry tomatoes, blue cheese and chives mainly for colour and mouth feel. For a special treat try toasted coconut flakes as a garnish it is fabulous. And fried Porcino mushrooms are sublime since they have almost the same flavour profile as Roquefort. 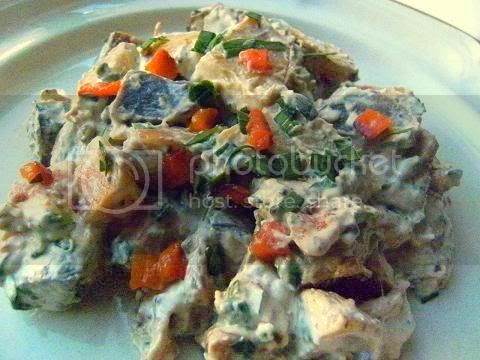 You can have this potato salad at room temperature or hot (best with spicy chicken wings), I will start with the room temperature method first. 1. Preheat oven to hot 450°F/230°C/gas mark 8. Cover two shallow baking trays with foil and lightly oil spray. 2. Place the potatoes into a large bowl and coat with the oil and mustard (and the whiskey if using). 3. 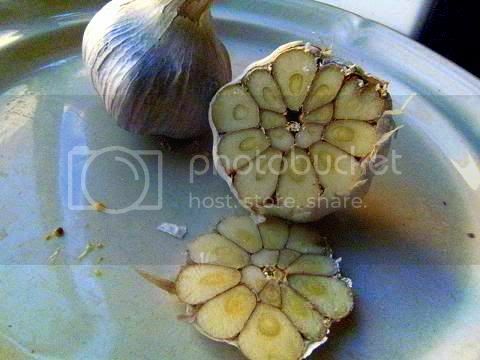 Cut the base off the garlic heads, leave on the papery casing, coat the cut-side with oil spray. 4. Place the potatoes and the garlic heads cut-side down in one layer over the two prepared baking trays. 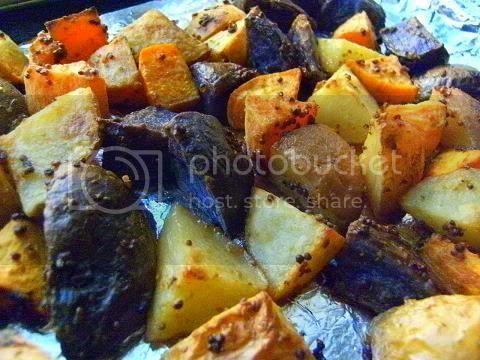 Sprinkle the potatoes with 1/2 teaspoon sea salt crystals. 5. Place into hot oven and bake (rotating the trays half way through) for 30-35 minutes or until a knife easily pierces one of the larger potato pieces you want to just roast them to a golden brown and tender, not crispy. Place the potatoes into a large bowl set aside to cool. 6. If using the red bell pepper (capsicum) cut into wide strips removing seeds and the white membrane spray lightly with oil. Place the strips under a broiler (grill) until the skins completely blacken. 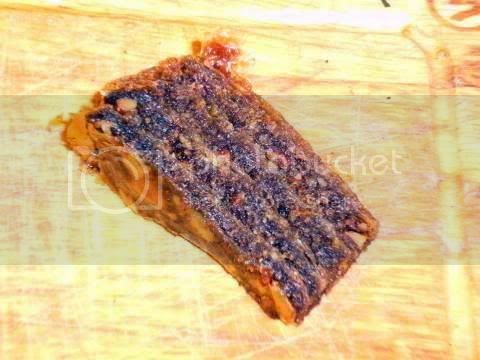 Place the strips into a small bowl covered with plastic wrap and a clean tea towel for 10 minutes remove blackened skin and chop finely. 7. 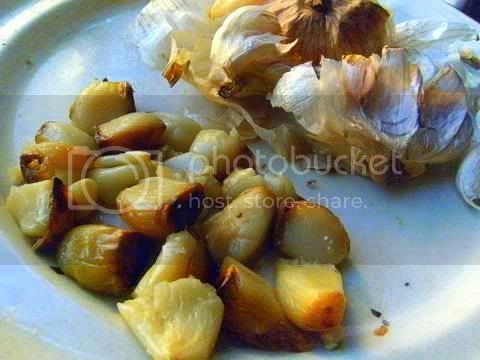 Squeeze out the garlic from the roasted garlic head into a medium bowl mash with a fork until smooth. Add the yoghurt, sour cream, crumbled cottage cheese, creamy blue cheese if using, the chopped herbs and ground pepper – mix to just combine. If too thick you can thin it with some non-fat (skim) milk. Think pouring cream consistency. 8. Dress the cooled potatoes with the sour cream/roasted garlic/herb mixture (and the chopped red bell pepper (capsicum) and/or the chopped walnuts or walnut oil if using). 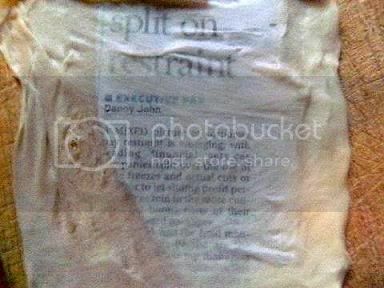 Sprinkle on 1/4 teaspoon sea salt. 10. Best served at room temperature or warm slightly in a microwave. 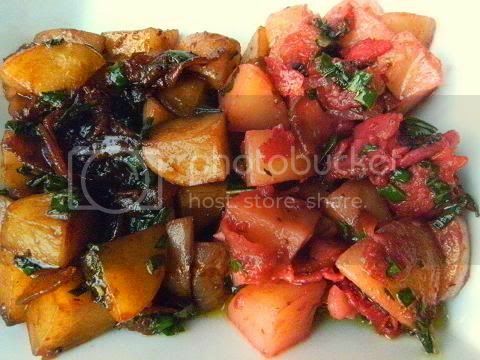 If you wish you can have the potato salad hot; bake the potatoes and garlic as above, prepare the dressing and garnishes as above (keep the potatoes hot while preparing these), then dress and garnish the still hot potatoes, serve immediately. 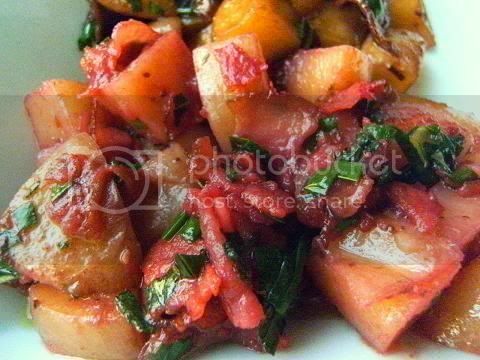 Avoid leftovers since the dressing is absorbed (over time) into the hot potatoes making the salad less creamy and tasty. Thank you Jami for the fantastic challenge this will be so much fun seeing all the different potato salads from around the world. I have a couple of special Aussie potato salads coming soon. I have a large number of potato salad recipes on file and I'm just deciding which ones to do after the Aussie versions. 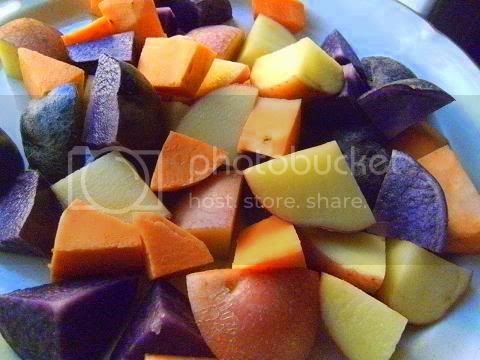 This is a gorgeously colourful fingerling potato salad that can be served hot, at room temperature or cold. 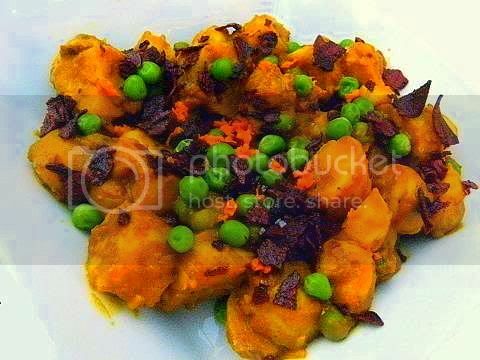 The recipe is based on the famous Indian curry called aloo matar (potato and pea curry). 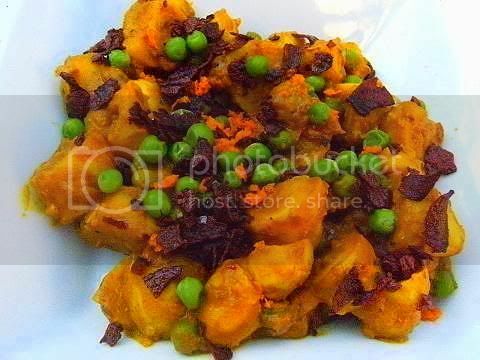 The dressing is a very mild sweet curry with no heat that colours the potatoes an exquisite ochre yellow, vibrant minted peas are added for flavour and colour and a garnish of dark purple beet(root) crisps add a wondrous deep earthy taste to the final dish. A grand amalgam of exotic tastes from the Indian subcontinent. 1. Microwave the fingerling potatoes in one layer (in batches if needed) on high for 5 minutes until fork tender. Peel and chop into bite sized pieces. Set aside and keep hot. 2. Heat the oil (or ghee) in a saucepan, add the mustard seeds fry until they start to pop about 1 minute. Add the minced onion and fry until translucent about 3 minutes. Add the curry powder, garam masala, ginger powder and garlic powder stir to coat onions and fry until aromatic about 2 minutes. Add tomato paste fry for about 3 minutes. 3. Add the water, vinegar and sugar, simmer until you obtain a paste the consistency of thin pouring cream (add more water as needed) about 3 minutes. Check for the balance of sweet/sour add a little more vinegar or sugar as needed, the paste should be mildly sweet with a spice over note. 4. Microwave the peas on high for 1 minute until bright green and hot throughout. Do not overcook. 5. Dress the hot potatoes and 3/4 of the peas with the curry paste, the potatoes will absorb the paste. 6. Garnish with the remaining peas and the crumbled beet(root) crisps. And if desired some finely grated carrot. 7. Serve hot, at room temperature or cold. 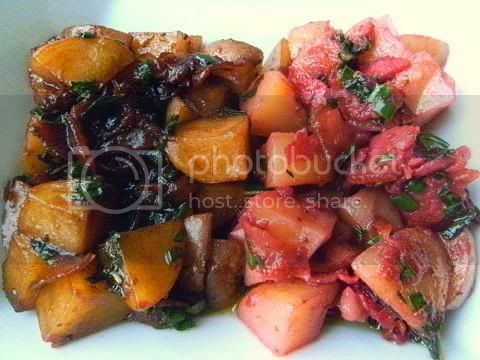 A quick, easy and inexpensive recipe that yields a very elegant and sophisticated tasting potato salad that uses a most unusual dressing made from balsamic vinegar and strawberry conserve (a classic flavour combination) which piques the taste buds. The dressing is complimented with crisp turkey bacon pieces, mint, chives and sea salt. 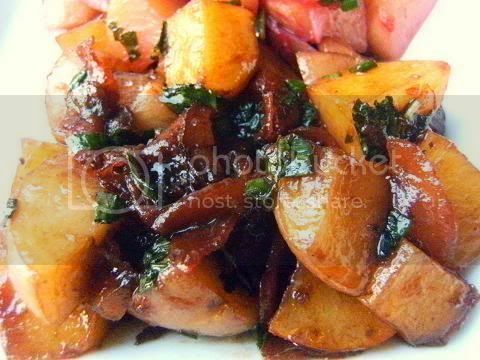 This potato salad has a lovely lingering after-taste that excites and stimulates the palate to want more and more. It has a refined air to it as if you had to tweak a couple of dozen ingredients and flavours to achieve the final balance of tastes, with each bite you encounter a new olfactory combination of the individual ingredients that is in this salad there is a tightly controlled gustorial oscillation between sweet, sour, salty, bitter and savoury that is just chic. 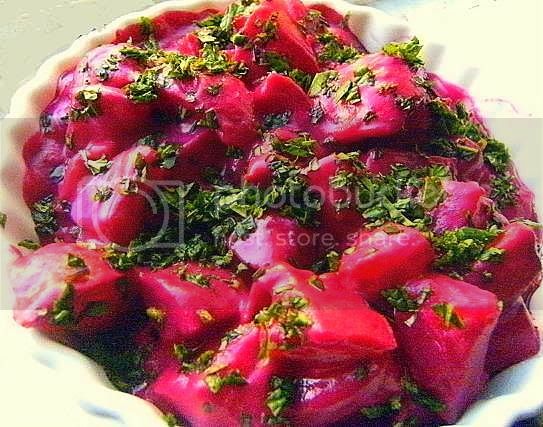 If you use white balsamic vinegar the final salad has a lovely pink hue that is so pretty, the white version would be a great potato salad to serve at a romantic Valentines dinner. 1. Microwave the whole fingerling potatoes (in batches if needed) on high for 5 minutes until fork tender. Peel and cut into bite-sized pieces. Set aside and keep hot. 2. 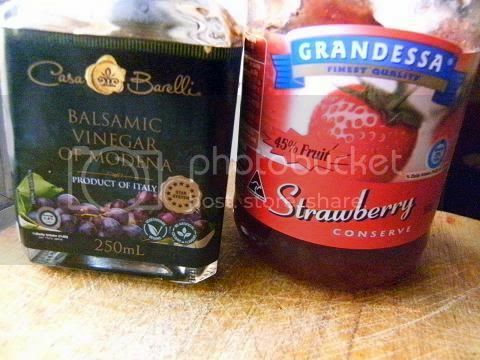 In a small bowl mix the strawberry conserve and the balsamic vinegar, slowly add the olive oil while whisking vigorously until combined (or use a blender if desired). Check for the balance of sweet/sour add a little more conserve or vinegar as needed, you are looking for a slight strawberry after-taste. 3. Starting in a large cold saucepan, fry the turkey bacon pieces until crisp. 4. Add the potato pieces to the saucepan stir to coat evenly with the bacon pieces. 5. Add the dressing coat gently. Wait for the dressing to be absorbed and cool. 6. Add the chopped herbs, sprinkle with the salt crystals and serve. 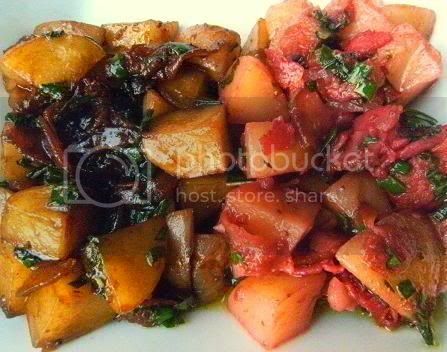 These potato salads are delightful to have in those moments when you want a cup of tea and an intimate tête à tête with a friend. Their zingy flavour profiles based on black tea, fruit and herbs will help stimulate the palate and tongue to create the perfect environment for a wonderful conversation. 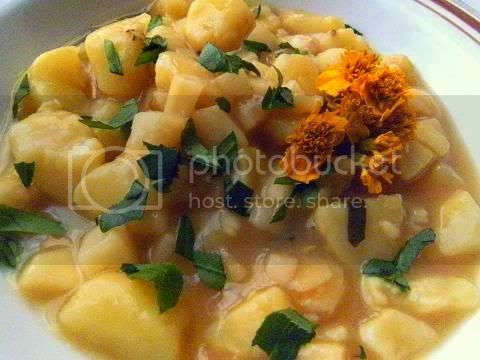 Science has shown that the flavour sensation of "potato" can be reproduced with a mixture of black tea, pickled cucumber juice, mustard, honey and butter this fact is used to obtain a strong harmonious flavour base to these potato salad. 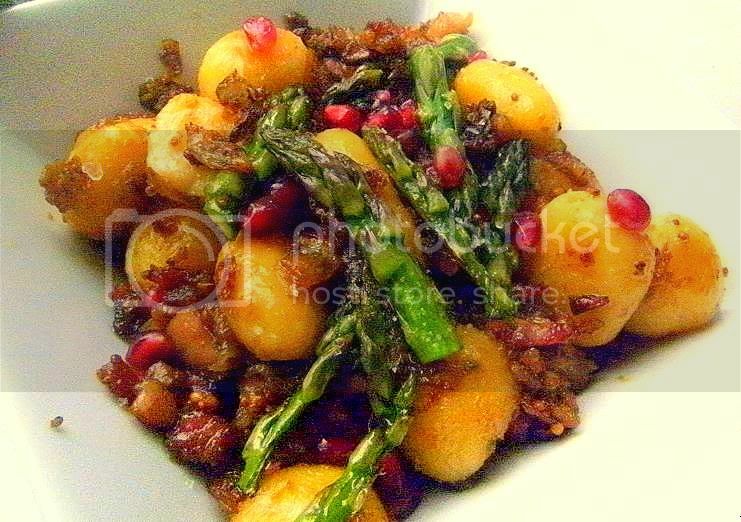 This base flavour is then enlivened with various fruits and herbs to produce two entirely different tea potato salads. 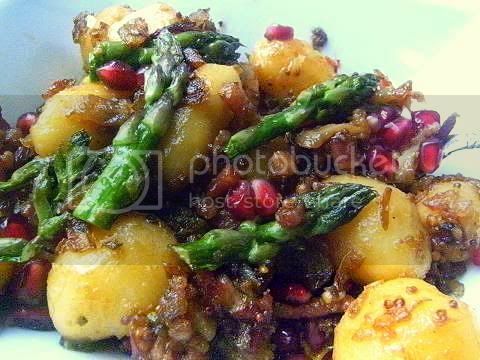 For a light breezy conversation try this potato salad. Black tea compliments the mango. mustard and honey while the tarragon gives a zingy anise kick. 1. Microwave the finger potatoes (in batches if needed) on high for 5 minutes until fork tender. 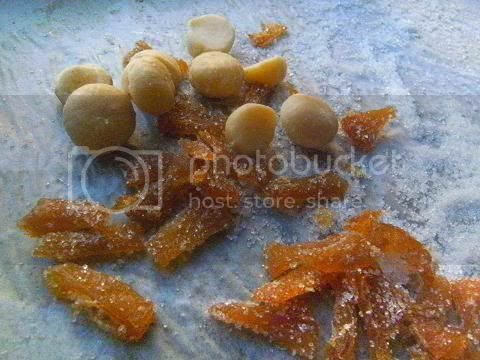 Peel and cut into bite-sized pieces. Set aside and keep hot. 2. Combine in a small bowl the tea, mango nectar, cubed mango, cucumber juice, and honey. 3. Add mustard in teaspoon amounts until you obtain a good balance between sweet and tangy. If the dressing is too thin add the potato starch paste until the consistency is of pouring cream. 4. Add dressing to the hot potatoes wait for the dressing to be absorbed and cool. 5. Garnish with the chopped herbs, herb flowers and a sprinkle of sea salt. 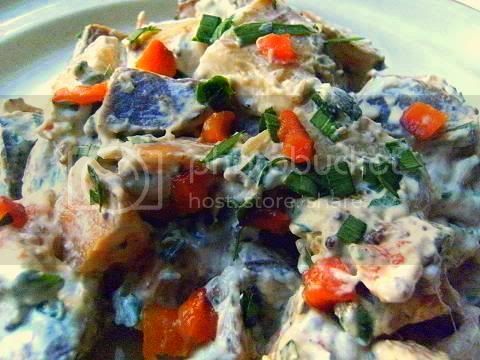 For a heavy and deep conversation try this potato salad it has a vibrant colour with a deep mellow flavour base. 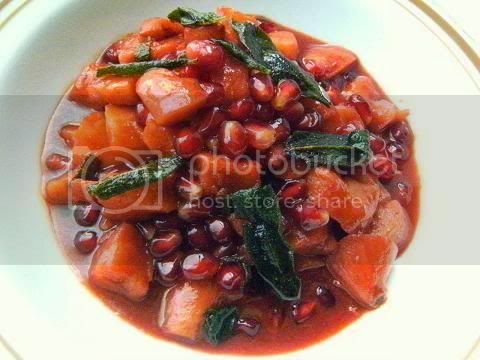 Pomegranate with tomato and potato is a classic flavour combination which is combined with crisp butter fried sage leaves to produce a thought provoking recipe. 2. 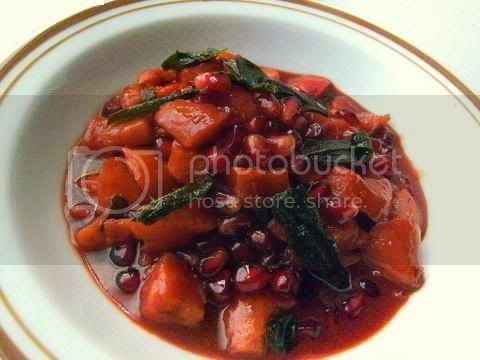 Combine in a small bowl the tea, fried tomato paste, pomegranate juice, pomegranate arils, cucumber juice, and honey. 5. Garnish with the crispy sage leaves, the butter and a sprinkle of sea salt. 6. Serve with rye sour dough grilled beef sandwiches. The usual reason to add high fat dressings (like mayonnaise and sour cream) to potato salad is make the finished dish as creamy as possible but there is a traditional method to cook potatoes that obtains a heavenly creamy and smooth interior texture – this technique is called brine boiling (also called salt potatoes or wrinkly potatoes). Brine (a mixture of salt and water) has a much higher boiling point temperature than normal water, this higher cooking temperature results in potatoes that are sublimely creamy, evenly cooked and smooth textured this is because the starch in the potatoes cooks more completely. 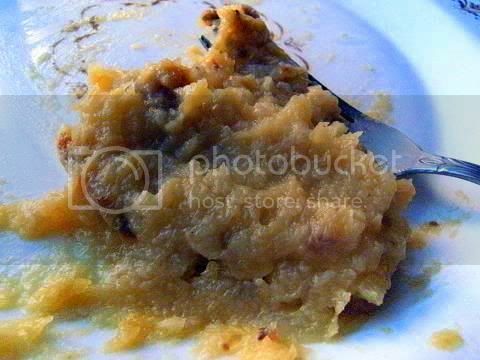 As the potatoes cook, the salty water forms a crust on the skin and seals the potatoes so they never taste water-logged like ordinary boiled potatoes often do. 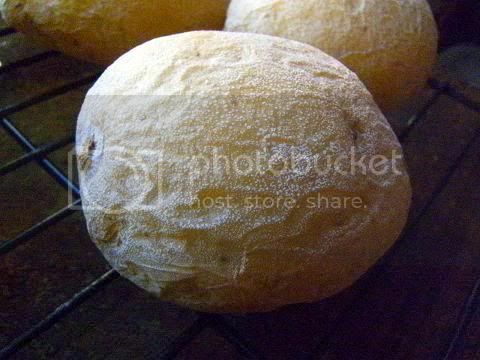 The potatoes have a unique texture closer to fluffy baked potatoes, only creamier. The whole potatoes (that is with the skins on) do not absorb the brine so you will find that you might need to add extra salt to the final dish! So don't be afraid of the amount of salt used in the brine. 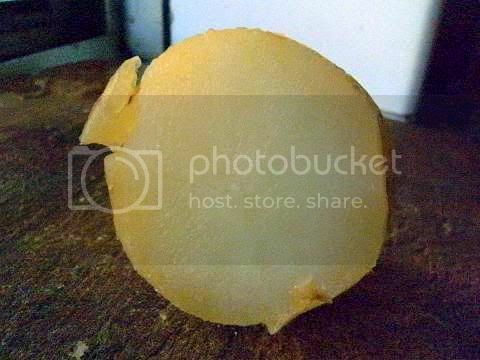 Salt potatoes keep well in the refrigerator and are excellent if sliced thinly and fried for breakfast. 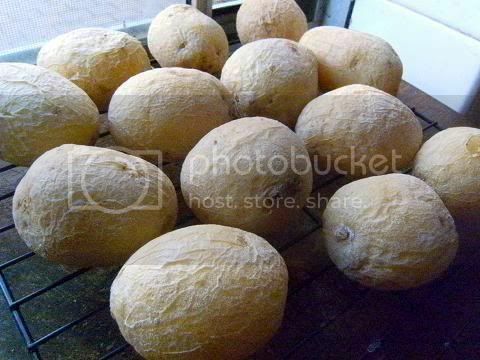 The cooked salt potatoes have a wrinkled skin and are coated in a very very thin layer of fine salt (about 1/4 teaspoon per pound of potatoes). It is intriguing that using this boiling technique you get something very similar to baked potato. Also your guests will wonder how you got such a thin even layer of fine salt crystals on the skins. 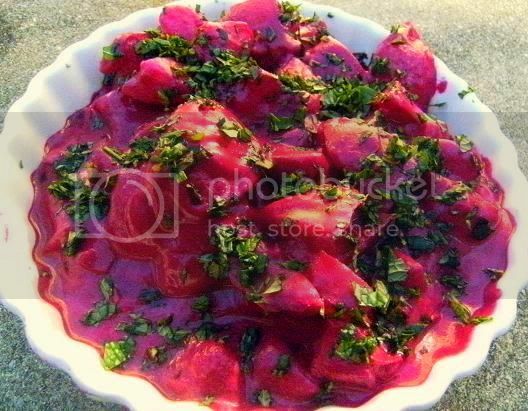 These totally exquisite salt potatoes are dressed in a luscious and delectable beet(root), coconut and lime dressing which results in a salad that is smooth, creamy, “almost like a mousse” as a friend mentioned when tasting it, with a huge depth of flavour because the dressing is absorbed into the potatoes which results in a salad that has the flavour profile in the potato flesh itself. Close-up of a salt potato notice the fine layer of salt on the skin, don't worry it is very very thin and only adds a tiny amount of salt to the final recipe (about 1/4 teaspoon per pound of potatoes), you can remove the skin if you desire. The brine is not absorbed into the potato. For each 4 cups (1 litre) of room temperature water use 1 cup of sea salt (or kosher salt or rock salt), do not use table salt since it has anti-caking additives that inhibits the action of the salt. Do not use salt with added iodine. If you can find table salt without additives then use half the amount of salt. Wash and scrub the potatoes, DO NOT remove skins and DO NOT cut the potatoes. Add the salt to the water add the potatoes cover the liquid with parchment paper cut to size. Heat till boiling, cover with lid and boil gently for 20-25 minutes until fork tender. Remove the cooked potatoes with tongs from the brine, let cool on a rack until a thin salt layer forms about 3-5 minutes remove skins if desired. Don't worry there is only a tiny amount of salt (about 1/4 teaspoon per pound of potatoes) on the wrinkled potato skins. Most people just add some butter and a small amount of chopped parsley or dill to the salt potatoes they are totally delicious. 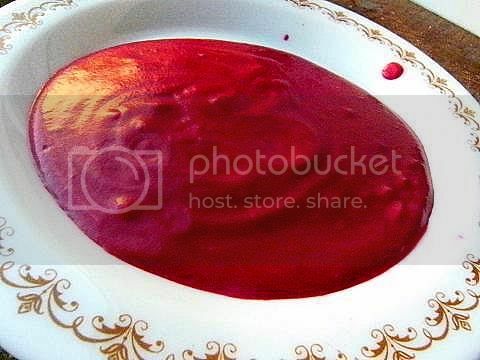 In a blender add the beet(root), light coconut cream (or coconut milk), lime juice and paprika (and the optional instant coffee or kecap manis) pulse until smooth. 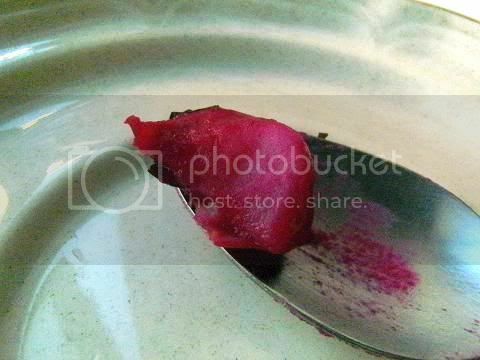 Taste to check balance of beet(root) and coconut by adding extra lime juice as needed. If too thick add more coconut milk. Garnish with the chopped lime zest, Kaffir lime leaves, chives and mint. You can replace some of the coconut milk with smooth goat's cheese (about 2 tablespoons) this version is excellent with strong game meat dishes. 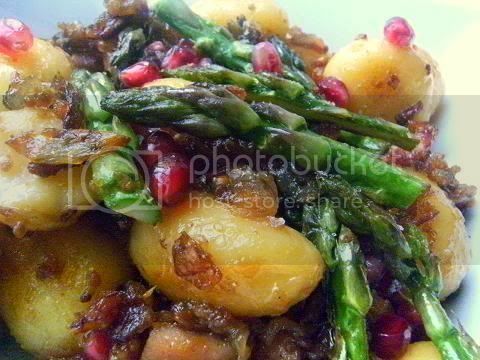 This marvellous hot salad uses tiny new potatoes and a rich slow-cooked dressing made with caramelised onion, asparagus, honey and mustard. The slowly cooked onion, garlic, asparagus and turkey bacon 'melt' into a lovely buttery sauce that is intensely flavoured and coloured. 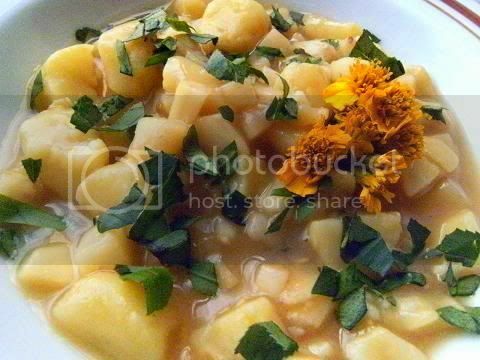 I have used canned potatoes on several occasions for this recipe they work very well.